SALT LAKE CITY, UTAH – For those who crave thick slabs of massive low end, HARMAN’s DigiTech has put its legendary DOD Meatbox Subharmonic Bass Synthesizer back on its pedal menu. An update of the cult favorite 1990s pedal with modern features like true bypass, TRS output, a 9-volt power supply input and a bright blue LED, the DOD Meatbox adds mammoth subharmonic enhancement and low-end power to bass guitars, extended-range and down-tuned guitars, synthesizers and even drum machines. Based on the iconic DOD Meatbox circuit design with updated components, the pedal serves up everything from subtle to insane amounts of deep bass enhancement. The Octave control adjusts the blend of the subharmonic signal to the dry, unaffected signal. The Sub knob controls the boost/cut of the subharmonic frequency, while the Low knob tailors the boost/cut of the low-frequency band. The Output control adjusts the output level of the signal while the effect is turned on and can add distortion at higher settings. The TRS Jack allows the signal to be split so that the octave+sub can be sent separately from the original dry signal to the PA or a low-frequency driver. The Meatbox provides input and output jacks and a 9-volt power supply input that makes it easy to add to any pedalboard. 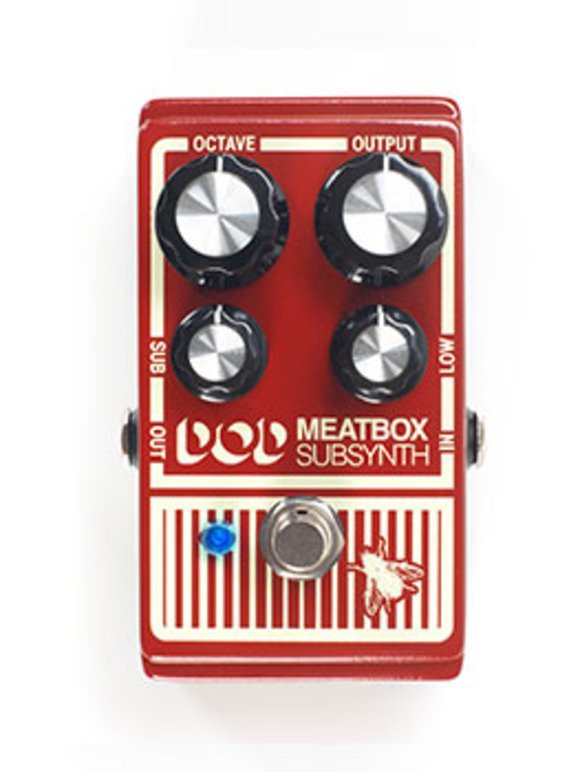 Unlike the original, the reissue DOD Meatbox provides true bypass operation, leaving the player’s tone uncolored when the effect is not engaged. Its road-tough enclosure features DOD’s classic retro graphics for a look that’s as unmistakable as the sound the Meatbox delivers. The DigiTech DOD Meatbox Subharmonic Bass Synthesizer will be available in July 2015 at a suggested retail price of $187.44 MSRP.